Lazo & De Romaña Abogados was awarded the “LAW FIRM OF THE YEAR: ANDES” recog­ni­tion by Lat­in­Fi­nance. 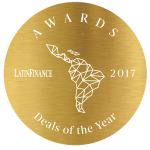 To­gether with this award, two of the trans­ac­tions we par­tic­i­pated in 2017 were also win­ners in the re­gion in the “Sov­er­eign Bond of the Year” (Peru´s Eu­ro­clear Bond Is­suance) y “Quasi-Sov­er­eign Bond of the Year” (Petroperú’s Bond Sale”) cat­e­gories. 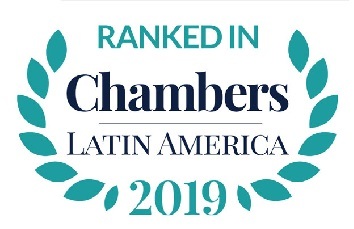 The prestigious English magazine Chambers & Partners, in its publications of the Ranking of the best Latin American firms from 2010 to 2018, has recognized our Firm in various areas. In its latest publication, we have been selected as one of the best companies in the areas of Banking and Finance, Stock Market, Capital Market, Competition & Antitrust, Corporation and M & A, Public Law and Real Estate. A special recognition to the partners Jorge Lazo, Fatima De Romaña, Jose Antonio Jaramillo Finn, Freddy Escobar, Bruno Gonzales, for their designation as “Ranked Lawyers” and our senior associates Bruno Gonzáles, Patricia Brocos, César lengua and Rocio Saux, for their inclusion within of the category “Associates to watch” in their respective areas of work. The prestigious English magazine The Legal 500 has been selecting us as a legal firm of excellence since 2012. In its latest publication, we are once again considered among the best law firms in Peru. On this occasion, there have been 7 recognized areas of our Study: Banking and Finance, Competition & Antitrust, Corporate and M & A, Insurance, Public Law and Regulation, Real Estate, and Environment. We received special recognition for our main partner, Fatima De Romaña, for his designation as “Leading Lawyer” in the Banking and Finance sector; and also to our lawyers Carlos Rojas (Competition & Antitrust), Luis Eduardo Aliaga (Real Estate) ,Bruno Gonzales (Banking and Finance), Juan Manuel Pazos (Enviroment) and Julián Li (Enviroment) for their inclusion in the “Next Generation Lawyers” category in their respective areas of work. “In 2018 our firm has been nominated by the prestigious publication Chambers & Partners for the awards “LAW CHAMBERS IN WOMEN LATIN AMERICA AWARDS 2018”. This award recognizes the contribution of women to generate changes in the legal profession, in the category of “Outstanding Contribution to Furthering Women´s Advancement. In the same way, in 2016, Fátima de Romaña was recognized in the category “Outstanding Contribution to Advancing Gender Diversity: Mentoring Lawyer of the Year”. 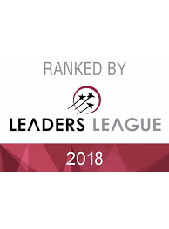 Lead­ers League rates the high­est ex­ec­u­tives at in­ter­na­tional level and has rec­og­nized our firm in the fol­low­ing areas of their 2017 Rank­ing of the Best Law Firms in Peru: Bank­ing, Fi­nance, Lit­i­ga­tion, Com­pe­ti­tion, Merg­ers and Ac­qui­si­tions.